Just one more day of action remains to be played out at the Seamaster 2018 ITTF World Tour Platinum Kaisa China Open as spectators eagerly wait to find out which players will be crowned champions on Sunday 3rd May. Four finals, four trophies up for grabs but who will come away smiling on the concluding day in Shenzhen? Follow the drama from 6.30pm (local time) with the first final of the day coming from the Women’s Doubles competition. 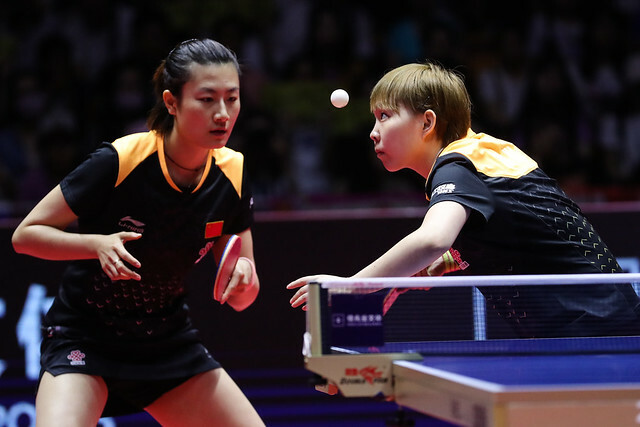 The host nation’s Ding Ning and Zhu Yuling meet Korea Republic’s Jeon Jihee and Yang Haeun in a repeat of the 2015 ITTF World Tour Grand Finals Women’s Doubles final – on that occasion the victory went to the Chinese duo but could we see a different outcome this time around? Ovidiu Ionescu and Alvaro Robles have gained a whirlwind of attention for their incredible run as a pairing in Shenzhen which has seen them progress all the way to the Men’s Doubles final. Victorious against World Champions Ma Long and Xu Xin in the previous round, the Romanian and Spanish team once again face opposition from China with Fan Zhendong and Lin Gaoyuan standing in the way. Then comes the first of two all-Chinese encounters as Ding Ning and Wang Manyu go head-to-head for the Women’s Singles title. Current World and Olympic Champion and 13 times a Women’s Singles gold medallist on the ITTF World Tour, Ding Ning is most certainly a titan of the sport and is chasing her third consecutive title win at the China Open. However, Wang Manyu is not to be underestimated and already has two Women’s Singles trophies to her name in 2018. Rounding off the exciting programme for the final day in Shenzhen we have a colossal battle to be decided with Fan Zhendong facing Ma Long in the Men’s Singles final. Only once in 13 head-to-head contests has Fan Zhendong managed to get the upper-hand against Ma Long on the international scene, two years back when the ITTF World Tour visited Chengdu. More recently Fan Zhendong narrowly lost out to his fellow countryman in the gold medal match at the Liebherr 2017 World Championships on Sunday June 5th 2017 – almost a whole year later can he avenge that defeat in front of the home crowd in Shenzhen? Don’t miss the exciting conclusion in Shenzhen, watch the action unfold live with itTV.